This is the normal setting if you want to have the dictionary learn your writing style and new words as you type them. 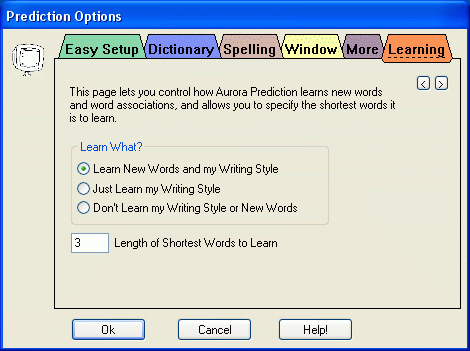 If you are a poor speller, you may want to turn on Spell Check as you Type..
Use this setting if you just want Aurora Prediction to learn your writing style, but not new words. Note that words that are specifically added through the spell checking features are added regardless of this setting. Use this setting if you want maximum performance from the Prediction system while not learning your writing style or new words. Note that words that are specifically added through the spell checking features are added regardless of this setting. Tip: Performance of Aurora Prediction will be much better if this radio button is selected. To reduce the number of nonsensical words learned by Prediction, set this to the number of letters a word must contain before Prediction will learn it. If you have Spell check as you type on, this setting is not used. Tip: To disable learning new words and phrases at all (with the exception of words added in the spellchecker,) set this to 1000.